Oculus VR is an American technology company founded by Palmer Luckey, Brendan Iribe, Michael Antonov, Jack McCauley and Nate Mitchell in July 2012 in Irvine, California, now based in Menlo Park. It specializes in virtual reality hardware and software products. In April 2012, Luckey announced the Rift, a virtual reality headset designed for video gaming, and launched a Kickstarter campaign in August to make virtual reality headsets available to developers. The campaign proved successful and raised $2.4 million, ten times the original goal of $250,000. Two pre-production models were released to developers; the Oculus VR DK1 (Development Kit 1) and Oculus VR DK2 (Development Kit 2). The consumer product was released on March 28, 2016 with an all-new design incorporating specialized VR displays, positional audio, and infrared tracking system. The company partnered with Samsung to develop the Samsung Gear VR in November 2015 for the Samsung Galaxy smartphones. Mark Zuckerberg would like to have 1 billion virtual reality headsets in consumer's hands. The original Oculus Rift (previously referred to as "CV1"), the first commercial VR headset released by Oculus VR. As a head-mounted display (HMD) designer at the University of Southern California Institute for Creative Technologies, Palmer Luckey earned a reputation for having the largest personal collection of HMDs in the world, and was a longtime moderator in Meant to be Seen (MTBS)'s discussion forums. Through MTBS's forums, Palmer developed the idea of creating a new head-mounted display that was both more effective than what was currently on the market and was also inexpensive for gamers. To develop the new product, Luckey founded Oculus VR with Scaleform co-founders Brendan Iribe and Michael Antonov, Nate Mitchell and Andrew Scott Reisse. Coincidentally, John Carmack of id Software had been doing his own research on HMDs and happened upon Palmer's developments as a fellow MTBS member. [better source needed] After sampling an early unit, Carmack favored Luckey's prototype and just before the 2012 Electronic Entertainment Expo (E3), id Software announced that their future updated version of Doom 3, Doom 3 BFG Edition, would be compatible with head-mounted display units. During the convention, Carmack introduced a duct taped head-mounted display, based on Palmer's Oculus Rift prototype, which ran Carmack's own software. The unit featured a high speed IMU and a 5.6-inch (14 cm) LCD, visible via dual lenses that were positioned over the eyes to provide a 90 degree horizontal and 110 degree vertical stereoscopic 3D perspective. Carmack later left id Software as he was hired as Oculus VR's Chief technology officer. Following the demonstration of the Oculus Rift prototype at E3 in June 2012, on August 1, 2012, the company announced a Kickstarter campaign to further develop the product. Oculus announced that the "dev kit" version of the Oculus Rift would be given as a reward to backers who pledged $300 or more on Kickstarter, with an expected shipping date set of December 2012 (though they did not actually ship until March 2013). There was also a limited run of 100 unassembled Rift prototype kits for pledges over $275 that would ship a month earlier. Both versions were intended to include Doom 3 BFG Edition, but Rift support in the game was not ready, so to make up for it they included a choice of discount vouchers for either Steam or the Oculus store. Within four hours of the announcement, Oculus secured its intended amount of US$250,000, and in less than 36 hours, the campaign had surpassed $1 million in funding, eventually ending with $2,437,429. On December 12, 2013, Marc Andreessen joined the company's board when his firm, Andreessen Horowitz, led the $75 million Series B venture funding. In total, Oculus VR has raised $91 million with $2.4 million raised via crowdfunding. Although Oculus VR had only released a development prototype of its headset, on March 25, 2014, Mark Zuckerberg announced that Facebook would be acquiring Oculus VR for US$ 2 billion, pending regulatory approval. The deal includes $400 million in cash and 23.1 million common shares of Facebook, valued at $1.6 billion, as well as additional $300 million assuming Facebook reaches certain milestones. This move was ridiculed by some backers who felt the acquisition was counter to the independent ideology of crowdfunding. Many Kickstarter backers and game industry figures, such as Minecraft developer Markus Persson, criticized the sale of Oculus VR to Facebook. On March 28, 2014, it was announced that Michael Abrash had joined the company as Chief Scientist. As of January 2015, the Oculus VR Headquarters has been moved from Irvine, California to Menlo Park, California, where Facebook's Headquarters is also located. Oculus has stated that this move is for their employees to be closer to Silicon Valley. In 2014, Oculus VR founded Oculus Story Studio to pioneer content creation for VR cinema. The studio was led by Creative Director Saschka Unseld, a six-year veteran of Pixar. The studio was first launched publicly at the 2015 Sundance Film Festival. They launched three VR films - Dear Angelica, Henry, and Lost - before being closed in May 2017. In 2014, Samsung partnered with Oculus to develop the Gear VR, after the success of the then-in-development Rift. During the course of 2014-15, two Innovator Editions (in-development versions of the Gear VR mainly sold to developers for sole research and understanding) were developed, manufactured, and sold. The device that the Innovator Editions used was the Note 4. On November 20, 2015, the consumer edition of the Gear VR was released to the public, and sold out during the first shipments. The device supported the Samsung Galaxy Note 5, Samsung Galaxy S6, Samsung Galaxy S6 Edge, Samsung Galaxy S6 Edge+, and later, the Samsung Galaxy S7, and Samsung Galaxy S7 Edge. In May 2015, Oculus acquired British company Surreal Vision, a company based on 3D scene-mapping reconstruction and augmented reality. News reported that Oculus and Surreal Vision could create "mixed reality" technology in Oculus's products, similar to the upcoming HMD, Microsoft HoloLens. They reported that Oculus, with Surreal's help, will make telepresence possible. On December 28, 2016 media reported that Facebook Inc., the parent company of Oculus, has acquired the Danish startup The Eye Tribe for an undisclosed amount. The company delivers eye tracking technology used to improve virtual reality user experience and has developed technology that only renders at the highest resolution where the user is looking. A lower resolution is used further away from the center of the visual field, reducing computation time. Following Facebook's acquisition of Oculus VR, ZeniMax Media, the parent company of id Software and John Carmack's previous employer, sought legal action against Oculus, accusing the company of theft of intellectual property relating to the Oculus Rift due to Carmack's transition from id to Oculus. The case, ZeniMax v. Oculus, was heard in a jury trial in the United States District Court for the Northern District of Texas, and their verdict was reached in February 2017, finding that Carmack had taken code from ZeniMax and used it in developing the Oculus Rift software, violating his non-disclosure agreement with ZeniMax, and Oculus' use of the code was considered copyright infringement. ZeniMax was awarded $500 million in the verdict, and both ZeniMax and Oculus are seeking further court actions. In November 2015 Oculus VR and Samsung released Samsung Gear VR. On Oculus Connect 2018, Zuckerberg revealed that the Oculus Rift, the Oculus Go and the Oculus Quest are considered to be the company's first generation of products, expecting new iterations of the three to be developed for a second generation of the company's technology. The Oculus Rift is a virtual reality head-mounted display. Software, most notably video games, must be custom programmed to use the Rift. Developer kit preorders were made available for $300 through Oculus VR's website starting on September 26, 2012. These kits sold at a rate of 4–5 per minute for the first day, before slowing down throughout the week. In March 2014 at GDC, Oculus announced the upcoming Devkit 2 (DK2) which they expected to begin shipping in July 2014. In January 2016 at CES 2016, Oculus announced it will start shipping the Oculus Rift headset to customers in 20 countries on March 28, and it will cost $599. In January 2016, as a gesture of appreciation, Oculus announced it will give the 6,855 people who participated in the 2012 Kickstarter project a special-edition Oculus Rift one day before the new product goes on sale to the public on March 28, 2016. Oculus Touch motion controllers officially launched on December 6, 2016 for $199. Touch motion controllers had 53 game options at launch. Oculus Rift Earphones also started delivery on December 6, 2016 for $49. On October 11, 2017 Oculus reduced the price of the Rift + Touch bundle to $399 in the US. In the years 2017 and 2018, Oculus Rift has beaten HTC Vive in terms of VR device shipments but it was only second to Sony's PlayStation VR shipments, which is estimated to amount to 2 million units. 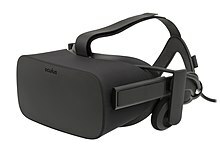 On March 20 2019, Oculus VR announced a new virtual reality head-mounted display, the Oculus Rift S. The device is scheduled for release in Q2 2019, and intended as a drop-in replacement for the original Rift, which will be phased out soon after Rift S is released. The new headset requires a PC like the original Rift does, and all games available for the original Rift should work seamlessly on the Rift S. The device is priced at $400; the same as the original Rift. However, it is a completely new headset with different hardware, featuring inside-out tracking and different controllers. On October 11, 2017 Oculus announced a stand-alone VR Headset named "Oculus Go". Oculus developed Oculus Go in partnership with Qualcomm, large US mobile SoC designer, and Xiaomi, China's largest smartphone maker. Like the Samsung Gear VR and Google's Daydream, the device is not tethered to a computer and it does not require a gaming system to work. It only consists of a headset but the device is not powered by a smartphone. The hardware is outfitted with a 5.5-inch 2560 x 1440 resolution display, higher-quality fresnel lenses used in Oculus Rift and is based on Qualcomm's Snapdragon 821 processor from 2016. It has 3 degrees of freedom tracking and a small controller that can be moved like a laser pointer. Oculus Go has two storage configurations available, with 32GB of internal storage for $199 USD or 64GB of internal storage for $249 USD. The headset has built-in surround sound with two spatial audio speakers, and the headset also has a 3.5 mm headphone jack for stand-alone headphones. Although the Go may be worn with or without glasses, the Go offers third party prescription lenses fitted for the headset for $79.99. On September 26, 2018 Oculus VR announced a stand-alone virtual reality headset named "Oculus Quest", expected for release during the facebook F8 conference from April 31st to May 1st. It uses motion controllers similar to the Rift's Oculus Touch and displays with resolution of 1600 x 1440 per eye with an option to adjust the lens spacing. The Headset will be launching in the spring of 2019. The starting price is $399 USD. The Quest is powered by the Qualcomm Snapdragon 835 mobile chip. While the computer built into the Quest may not be as powerful as a standalone PC, not requiring a personal computer to operate makes it possible to move around without restrictions. The headset is lighter and more comfortable to wear with the weight more evenly distributed. The headset includes four wide-angle cameras for inside-out positional tracking, and contrarily to the Oculus Go, which lacks positional tracking, the Quest's tracking system does provide the six degrees of freedom provided by the Rift and other headsets. Games under development for Quest include Vader Immortal, Robo Recall, Moss, The Climb, Project Tennis Scramble, and Face Your Fears 2. 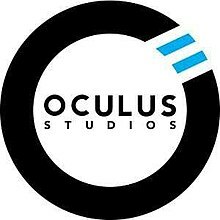 This is the Logo of Oculus Studios. Oculus Studios is a division of Oculus that focuses on funding, publishing and giving technical advice to third party studios to create games and experiences for Oculus Rift. Facebook pledged to invest more than $500 million USD in Oculus Studios for games. ^ Thang, Jimmy (October 18, 2017). "Oculus' Jason Rubin Remains Optimistic About VR And Is Proud Of What The Company Has Achieved". ^ a b "Facebook to Acquire Oculus". Facebook Newsroom. Facebook. March 25, 2014. Retrieved March 26, 2014. ^ a b Plunkett, Luke (March 25, 2014). "Facebook Buys Oculus Rift For $2 Billion". Kotaku.com. Retrieved March 25, 2014. ^ a b Welch, Chris (March 25, 2014). "Facebook buying Oculus VR for $2 billion". The Verge. Retrieved February 2, 2017. ^ "IFA 2014: Samsung Galaxy Note 4, Note Edge, Gear VR and Gear S hands-on". GSMArena.com. Retrieved November 24, 2015. ^ "Oculus VR: the $2bn virtual reality company that is revolutionising gaming". telegraph.co.uk. Retrieved May 9, 2017. ^ "Oculus "Rift" : An open-source HMD for Kickstarter". Mtbs3d.com. Retrieved 2013-09-09. ^ Hollister, Sean. "Under new management, Oculus intends to commercialize the virtual reality headset". theverge.com. Retrieved August 16, 2012. ^ "Santa Ana police chase: Pedestrian identified". Retrieved March 26, 2014. ^ Neil Schneider. "The #1 Stereoscopic 3D Gaming (VR Gaming, 3D Gaming) and VR Resource - Meant to be Seen - John Carmack Talks VR at QuakeCon 2012". mtbs3d.com. Retrieved February 2, 2017. ^ "Carmack Makes Virtual Reality Actually Cool". ^ "John Carmack and the Virtual Reality Dream". Eurogamer. June 7, 2012. Retrieved August 1, 2012. ^ Rosenberg, Adam (June 14, 2012). "Hands-On With Oculus Rift, John Carmack's Virtual Reality Goggles". G4TV. Retrieved February 2, 2017. ^ Gilbert, Ben. "Oculus Rift hires Doom co-creator John Carmack as Chief Technology Officer". engadget.com. Retrieved August 7, 2013. ^ "Update on Developer Kit Technology, Shipping Details". Oculus VR. 2012-11-28. Retrieved 2014-03-20. ^ a b "Oculus Rift: Step Into the Game". Retrieved August 1, 2012. ^ "Oculus Rift virtual reality headset gets Kickstarter cash". BBC. August 1, 2012. Retrieved February 2, 2017. ^ Matulef, Jeffrey (August 1, 2012). "John Carmack's snazzy VR headset takes to Kickstarter with the Oculus Rift". Eurogamer. Retrieved February 2, 2017. ^ "Watch the QuakeCon VR Keynote Tonight Live at 7PM EST. Oculus Rift Kickstarter Passes $1 Million Under 36 Hours « Road to Virtual RealityRoad to Virtual Reality". Roadtovr.com. August 6, 2012. Retrieved February 2, 2017. ^ "Oculus Rift Virtual Reality Headset Developer Kits Now Available To Pre-Order". Geeky Gadgets. September 27, 2012. Retrieved February 2, 2017. ^ Takahashi, Dean. "Oculus VR raises $75M round led by web browser inventor Marc Andreessen's VC firm to launch virtual-reality goggles". venturebeat.com. Retrieved December 12, 2013. ^ Gleasure, R., & Feller, J. (2016). A Rift in the Ground: Theorizing the Evolution of Anchor Values in Crowdfunding Communities through the Oculus Rift Case Study. Journal of the Association for Information Systems, 17(10), 708-36. ^ Victor Luckerson (2014-03-26). "When Crowdfunding Goes Corporate: Kickstarter Backers Vent Over Facebook's Oculus Buy". Time. Retrieved 2014-03-26. ^ Philippa Warr (2014-03-26). "Minecraft for Oculus Rift axed, Facebook too 'creepy'". Wired. Retrieved 2017-02-01. ^ "Introducing Michael Abrash, Oculus Chief Scientist". Retrieved March 28, 2014. ^ Leung, Lily. "Oculus moves out: Irvine VR goggles maker moves HQ to Menlo Park, closer to parent Facebook". Retrieved March 16, 2016. ^ Constine, Josh (January 26, 2015). "Oculus' Pixar Exec-Led Story Studio Will Release VR Cinema Examples". TechCrunch. Retrieved November 14, 2016. ^ "Oculus Announces Closure Of Oculus Story Studio". Game Informer. Retrieved 2018-04-11. ^ "IFA 2014: Samsung Galaxy Note 4, Note Edge, Gear VR and Gear S hands-on". GSMArena.com. Retrieved March 16, 2016. ^ "Introducing the Samsung Gear VR Innovator Edition". oculus.com. Retrieved March 16, 2016. ^ "Introducing the Samsung Gear VR Innovator Edition". oculus.com. Retrieved May 21, 2018. ^ "Samsung Gear VR now available for pre-orders at $99". oculus.com. Retrieved March 16, 2016. ^ Gaudiosi, John (June 1, 2015). "What the Surreal Vision acquisition means for Oculus". Fortune. Retrieved March 16, 2016. ^ Etherington, Darrell (May 26, 2015). "Oculus Acquires Surreal Vision To Bring The Real World to VR". TechCrunch. Retrieved March 16, 2016. ^ Constine, Josh (2016-12-28). "Oculus acquires eye-tracking startup The Eye Tribe". 2016-12-29. Retrieved February 2, 2017. ^ Larson, Selena (February 1, 2017). "Facebook loses $500 million Oculus lawsuit". CNN. Retrieved February 2, 2017. ^ Wawro, Alex (June 21, 2017). "After winning $500M in lawsuit against Oculus, ZeniMax pushes for more". Gamasutra. Retrieved June 22, 2017. ^ "Facebook CEO Mark Zuckerberg: 'Oculus Quest Completes Company's First-Gen Lineup'". RoadtoVR.com. 2018-10-15. Retrieved 2018-10-18. ^ "Oculus Rift pre-order open now". Mtbs3d.com. Retrieved 2013-09-09. ^ "Announcing the Oculus Rift Development Kit 2 (DK2)". Oculus VR. 2014-03-19. Retrieved 2014-05-10. ^ Day, Matt. "CES 2016: Rewind from Day 2 of the Consumer Electronics Show". seattletimes.com. Seattle Times. Retrieved January 7, 2016. ^ Stark, Chelsea. "Oculus will reward its original Kickstarter backers with the new Rift". mashable.com. mashable.com. Retrieved January 7, 2016. ^ "You can now pre-order Oculus Touch controllers for $199". engadget.com. Retrieved March 10, 2017. ^ "Oculus Rift Gets Permanent Price Drop to $399". pastemagazine.com. Retrieved 2018-04-11. ^ "VR device shipments by vendor worldwide 2017-2018 | Statistic". Statista. Retrieved 2018-09-06. ^ Statt, Nick (2019-03-20). "Oculus unveils the Rift S, a higher-resolution VR headset with built-in tracking". The Verge. Retrieved 2019-03-20. ^ "Oculus Rift S Is Official: Higher Resolution, 5 Camera Inside-Out, $399". UploadVR. 2019-03-20. Retrieved 2019-03-20. ^ "Oculus Announces New Standalone Headset, 'Venues' at Oculus Connect". Retrieved October 15, 2017. ^ "Oculus Go specs: Xiaomi-made with Snapdragon inside". SlashGear. 2018-01-09. Retrieved 2018-05-04. ^ a b c Robertson, Adi (May 1, 2018). "The Oculus Go improves mobile VR, but there's still a long way to go". The Verge. Retrieved 2018-09-06. ^ de Looper, Christian (2018-05-18). "VR curious? The $200 Oculus Go is the perfect gateway". Digital Trends. Retrieved 2018-09-06. ^ a b "Oculus Go". oculus.com. Retrieved 2018-05-04. ^ "Oculus Quest is a new, $399 standalone VR headset shipping next year". ^ "Hands on: Oculus Quest review". TechRadar. ^ Constine, Josh (26 January 2015). "Oculus' Pixar Exec-Led Story Studio Will Release VR Cinema Examples". TechCrunch. Retrieved 14 November 2016. 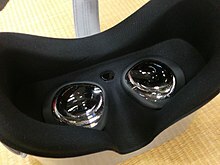 Wikimedia Commons has media related to Oculus VR. "Tuscany Demo" using AstoundSound on TrueAudio on YouTube — special version of Oculus VR's "Tuscany Demo" showcasing GenAudio's AstoundSound with calculations shunted to AMD TrueAudio.